By alchemical transformation, i. e. transmutation of the element antimony, a significant remedy emerges – In today’s opinion this process seems impossible but has now been comprehended at the University of Munich. No one believed it, but the alchemists were right! “Of all minerals antimony contains the highest and strongest Arcanum (remedy). It purifies itself and at the same time everything else that is impure. Furthermore, if there is nothing healthy at all inside the body, it transforms the impure body into a pure one which was proved in cases of leprosy.” Thus Paracelsus praises the extraordinary healing power of antimony (Sämtliche Werke, vol. III, Aschner-edition, p. 151). Reports such as these were the impetus to investigate the preparation of alchemical remedies such as antimony in the Medical Faculty of the University in Munich. Whether antimony as metal is actually transformed in the alchemic laboratory process was investigated within the framework of a PhD. In today’s medicine, namely due to its toxicity, antimony is mostly used in very little doses as an emetic only. No one ever thought in the slightest that a real transformation of the elements would be possible. The true reason for "producing gold"
Alchemy is imprinted into the memory of mankind as an "art of making gold". In dictionaries the unavailing endeavours of the mediaeval quackery is of course emphasized. A so-called transmutation is meant, thus the transformation of a chemical stable element into another element (instable, radioactive elements degrade by themselves in the course of centuries or millenniums and therefore transform themselves into another element). In modern physics such processes of artificial transformation with the help of particle accelerators are only possible with enormous amounts of energy and is only possible with a few select atoms. In Alchemy however, the transformation for instance of lead or mercury into gold is considered possible and is actually proof of the supreme art of an alchemist. Whoever succeeds, is also able to produce the highest remedy of Alchemy, "the philosopher‘s stone". Thus this "metal-test" is only – admittedly the most spectacular – proof that an alchemist truly has the highest arcanum at his disposal, and that he gives his patients no other less laborious and therefore less expensive elixir instead. However, the transformation of gold was not examined at the University of Munich. 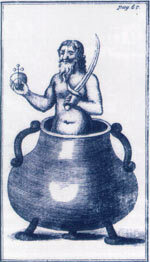 With the processing of antimony, according to the alchemic laboratory instructions, the medics unwillingly produced evidence that in principle such a transformation of alchemy is possible. "The disappearance of antimony after extraction is not clarified", Dr. David Schein summarizes as the result of his PhD. With this objective observation he skilfully avoids any hints of the absolute amazement of the scientists facing this process: this namely means no less than the caving-in of today’s scientific knowledge of the unalterable chemical elements. Furthermore: In the spectacular process carried out, according to ancient alchemic laboratory-instructions by Dr. Schein, the poisonous antimony ore, similar to arsenic, becomes a completely non poisonous remedy. With this the ancient recipes and reports on healing by Paracelsus and Basilius Valentinus, were confirmed in an impressing way. They very much differed from the healing medication of antimony in the later centuries. Due to a good reputation, which Paracelsus enjoyed, the highly praised antimony-remedies were distributed fast. The knowledge for the correct alchemic processing, however, was more and more forgotten and the quacks simply sold toxic antimony-water. Already in the middle of the 17th century, this incorrect use of remedies lead to the fact that the graduates of medical universities had to swear never to use antimony- or mercury-compounds anymore. Although in 1666 this ban was abrogated again and it was only recommended to keep the dose as low as possible. Only very few still knew how to process the completely nontoxic antimony-remedies. In 1978 within the framework of his PhD in the field of medicine, David Schein wanted to examine the truth content of ancient instructions for the production of alchemic remedies from antimony in a practical way. "Was an ancient, highly effective healing substance forgotten?" he asked himself in face of the many ancient medical texts which reported about very astonishing healing successes due to a "spit-glass", as antimony was also called because of its outer form at that time. As a matter of fact, the application of antimony for healing has been a tradition for thousands of years. Back in the 16th century B.C. in "Eber‘s Papyrus" was stated that antimony-compounds could be used successfully for eye diseases. In the first century A.C. the Roman doctors also used it against "wild flesh" and ulcers; and in the Middle Ages it was additionally recommended to treat haemorrhoids, wounds, fistulas, skin cancer, leprosy and other sufferings. For the first time, Paracelsus described the inner application of antimony which in an alchemical way, however, should be "freed of its toxicity" before that. He described his antimony-processing altogether as a universal remedy for purification of the body of "toxins": "In the same way and form that antimony finishes in gold (in the sense of cleansing), it will perfect the body as well. It namely contains the Essentia, which does not allow anything impure to come together with the pure" (vol. III, p. 151). Paracelsus refers here to a very astonishing characteristic of antimony: if one adds it to a blend of melted metals, it will associate with the containing gold and part from the "impure" metals. Because antimony seemingly "eats" and "extracts" the precious metals, it was also called "wolf of metals" or "the magnet of the wise" in earlier times. This apparent magical force of antimony has a similar effect in man as well. According to the alchemical processing it also separates the "pure" from the "impure" and leads the "ill" (in the sense of the deposited "toxins", metabolic waste products and disease-causing agents) out of the body. According to Paracelsus, antimonium oil, which he administers together with the quintessence of balm (melissa), is the most intensive: "... likewise Antimonium sublimed, calcinated, reverberated and incorporated in oil, then see what kind of enormous use, great power, great virtue, quick effect it reveals and proves" (vol. III, p. 243). The antimonium-oil "… shall be prescribed in Quinta Essentia Melissae" (vol. III, p. 151). In his PhD, David Schein worked according to a formula of the alchemist Basilius Valentinus who became well known by his script, "Triumph-Waggon of Antimony", published in 1604. The instructions at first sound very simple if rather laborious: at first antimony-ore, which consists of a mixture of different antimony-oxides and especially of sulphides, is slowly, gently heated until there are no more fumes (because of the highly-toxic vapours amateur alchemists should not reproduce this process without a vacuum pump!). Then everything is melted to glass. This glass can adopt any colour of the spectrum and Basilius Valentinus and Paracelsus rated this as a sign of antimony containing all qualities. Depending on the processing, antimony could also be used as a kind of universal remedy for all diseases. In fact, Dr. Schein succeeded to produce antimony-glass in the colours red, yellow, orange, green, brown, grey, white and black in varying the parts of the different antimony-oxides and -sulphides. Valentinus recommends to use only golden coloured antimony-glass for further processing. After cooling one should grind the antimony-glass very fine. Concentrated vinegar is then poured onto the powder for several times until it is coloured red-yellow. Then the powder is doused with distilled rainwater up to 144 times and by distillation it is separated from it again. Then it has – according to Valentinus – strangely a sweet taste which was also the case in Dr. Schein‘s processing. Finally the powder is steeped in alcohol. First the liquid will turn black and on its surface all colours of the rainbow shimmer anew, and then it will turn red. The so emerged liquid is an antimony-tincture which is now suitable for inner application. As simple as the description of the production – which takes several weeks – sounds, it nonetheless holds countless dangers. Although Basilius Valentinus was very precise in comparison to other alchemical scripts, today the ancient language and symbolic codings are enough hindrance for a simple realisation. On top of that, according to today’s level of knowledge in chemistry, certain production steps are simply considered impracticable and unreasonable. For instance the described reaction by Basilius Valentinus about antimony-compounds with acetic acid and alcohol is impossible in today’s opinion. Therefore, Dr. Schein was prepared for unpleasant surprises and it was a real sensation to him, that all of these "impossible" chemical reactions actually took place in the way they were described. He had only to follow the ancient instructions precisely – again proof for the very precise observation of nature by the alchemists and their highly amazing knowledge. Dr. Schein suspects that by heating up and melting of antimony to glass, the physical and spatial structure, thus the arrangement of molecules of this toxic metal changes and is the reason for the unknown chemical reactions which become possible. By this it can adopt new characteristics. At the same time, however, he admits: "There is a phenomenon whose essence can not be understood with the help of today’s knowledge." Finally the medico could confirm the non-toxicity of the emanated compounds, for "the antimony-tinctures are chemically understood neither as an antimony-compound nor do they contain dissolved antimony". Instead they are complex organic compounds, which have not yet been examined in detail. They probably emerge from unknown reactions of vinegar and alcohol, which both are of organic origin, with antimony as a kind of catalyst. The imperial orb symbolizes antimony, it is held by Saturn which stands for the grounding forces of the metals (from Isaak Hollandus: “Hand des Philosophen” (Philosopher‘s Hand)). In this respect it is amazing that in the course of the alchemic processing the content of toxic antimony in the solid remaining substance is reduced to about 60 %, and this missing amount cannot be found in the extracted tinctures. Thus the solid substances contain 31 % pure antimony before the extraction in alcohol, and after the processing it contains only 11 %. But the extract itself does not at all contain anymore pure antimony. Therefore a transmutation of the element had to take place. The alchemists were very conscious about this transformation: "Thus principally antimony is nothing but a pure poison, and not a minor, little and low poison, but a very high noble poison, through and through, and even the greatest poison by which one can execute man and animal to death," warns Basilius Valentinus in his "Triumph-Waggon of antimony" and continues: "After the processing of spit-glass one can not find anymore poison, for antimony has to be completely transformed by the spagyric art (the alchemical laboratory-processing) and a remedy has to emerge from the poison." What Dr. Schein apparently did not know: Even today such tinctures from antimony are produced as a remedy. Already in the beginning of the 20th century Baron Alexander von Bernus, the most renowned alchemist and founder of the famous “Laboratorium Soluna” in Donauwörth (Germany) rediscovered the ancient alchemical antimony-recipes of Basilius Valentinus for the therapy. And about two years ago, Achim Stockardt, the re-discoverer of the Paracelsus-Gold-Essence “Aurum Potabile”, also succeeded in reproducing these high remedies from antimony according to ancient formulas of Paracelsus: the antimony-oil combined with the quintessence of balm as “Oleum antimonii”. According to the experience of doctors and curative practitioners, antimony relieves joint pain and myalgia and other sort of pains, which can be associated with deposits. Besides this, it effects both sicknesses provoked by bacteria as well as viral diseases. “It is, however, not clear if this is due to direct anti-effects such as with antibiotics, or if the body’s own immune response is responsible,” admits Anna Röcker, a curative practitioner from Munich. Obviously Basilius Valentinus had an antibacterial application in mind, if he recommends the intake for a better wound healing, “so that the inner source of the wound‘s secretion is dried up”. Anna Röcker also successfully used antimony compounds for fungal infections like intestinal mycosis, Candida Albicans. With its Antimony “the philosopher‘s magnet” could actually help “to pull out all of the impure” such as bacteria, viruses and fungi as well as certain metabolic deposits, just as Paracelsus and Basilius Valentinus have described. Regarded energetically, Antimony is alchemically considered the “remedy for grounding” par excellence. Thus it is capable of re-integrating body, spirit and soul into the rhythmic cycles on earth. The traditional alchemic symbol for antimony, the “imperial orb” with the cross above the globe, depicts the universal integrating effect. It represents the power of the four elements related to the cyclic courses of nature. The rhythms within man also belong to it like the sleep-wake rhythm. That is why antimony is for instance used for sleep disorders, which may also be related to congestion. Antimony as the “wolf of metals”: Antimony separates gold from impure metals, it is symbolized by the wolf eating the sick, old king. 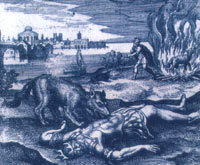 With a later separation by the melting of gold and antimony, pure gold is gained, which is symbolized in the background by the burned wolf and the reborn king emerging from the fire (from Michael Maier: “Atlanta fugiens”). Rudolf Steiner, the founder of Anthroposophy, stated that the reason for the great universal healing power of antimony lies within a close relationship: Comparable to the human being, who stands between the animal kingdom and angels, antimony is neither mineral nor ore, neither crystal nor metal – both are “beings betwixt”, he said. Therefore Steiner thought: “Man is actually antimony.